The Divine Art features masterpieces from the 15th through the 18th century that will cover entire walls of gallery space. Massive in scale and breathtaking in scope, these life-sized tapestries depict allegories, biblical and Christian themes, events from ancient history, and mythological scenes, as well as representations of everyday life and verdures. Included in the display are tapestries from England, Flanders, France, the Franco-Flemish region, Italy, the Netherlands, and Switzerland. 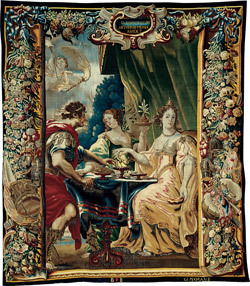 A set of 14 tapestries comprises a cycle representing The Story of Caesar and Cleopatra. Often produced in multiple suites or chambers, many of the tapestries in this exhibition are connected to related pieces found in collections around the world. Having undergone an extensive conservation process at the laboratory of De Wit Royal Manufacturers in Mechelen, Belgium, the tapestries were examined by scholars who made extraordinary discoveries about the collection. These findings are detailed in a fully illustrated catalogue available for purchase at the Museum Shop or online. Led by principal author Koenraad Brosens of the Katholieke Universiteit, Leuven, Belgium, European Tapestries in the Art Institute of Chicago marks a major contribution to tapestry scholarship and features chapters on the history of the collection, Chicago donors, technical data, and conservation findings. The exhibition The Divine Art: Four Centuries of European Tapestries was organized and curated by Christa C. Mayer Thurman, the Christa C. Mayer Thurman Chair of Textiles. Major funding is generously provided by The Chauncey and Marion D. McCormick Family Foundation and the Julius Lewis/Rhoades Exhibition Endowment Fund. Additional support is provided by the Community Associates of the Art Institute of Chicago. Support for the catalogue is provided by The Andrew W. Mellon Foundation. Cleopatra and Antony Enjoying Supper, c. 1680. After a design by Justus van Egmont. Flanders, Brussels. Gift of Mrs. Chauncey McCormick and Mrs. Richard Ely Danielson.